Prepping for BlogHer ’12 (I’m speaking! 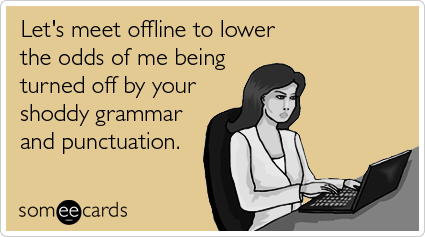 ): What are your most burning grammar questions? You are here: Home / Writing Lab / Blogging / Prepping for BlogHer ’12 (I’m speaking! ): What are your most burning grammar questions? So, I found out last week that I am going to be speaking at BlogHer ’12! I am so excited. Especially since it was one of my goals for the year to “attend and participate in BlogHer ’12.” I wasn’t sure what that meant when I wrote it, but I knew I wanted to make it happen. I’ll be in the Writing Lab at BlogHer ’12. Pretty fitting, right? On Saturday, I’ll be leading a workshop called “Grammar Clinic: How to Identify and Avoid Common Errors.” There will be two 30 minute sessions, where I’ll answer bloggers’ questions on grammar and share some of my tips and resources. I’m one of those writers who believes in breaking rules from time to time, even when it comes to grammar. Like using fragmented sentences or starting a sentence with the word “and.” However, there are some rules that just shouldn’t be broken. Even if you’re not going to BlogHer ’12, I’m curious about your grammar questions. I’d love it if you could help me prepare for my workshop. Of course, I will be blogging about what we talk about in the session, and I am always happy to share resources. So tell me, please. As a blogger, what are your most burning grammar questions? Any chance you can highlight some of those tips in a post after the conference? I’m a big comma fan (possibly use it too much) and would find a post incredibly useful. Absolutely! I will do a wrap up of everything we talked about in the sessions. I think it will be interesting to hear everyone’s questions. It seems that no matter how many times I carefully proofread, there is always at least one inadvertent error in my post. I freely admit to taking creative license with grammar so my posts are more conversational… I mis- and overuse ellipses like crazy! I know what you mean. Proofing is important, but you can also over proof! I can always find something I want (or need) to change in a post. At some point, you’ve got to stop analyzing it. Thanks for the feedback! I’m sure there will be more. I’ll be checking out your National Grammar Day post now. Thanks! Thanks, Michelle. This helps me prepare! I just looked and the sessions are already filled. I’m thinking a least one post – maybe more – will come out of this. Big Yeh! for you on your speaking gig! I admit I’m horrible at all of these things, i wasn’t exactly my high school English teachers favorite student. btw. I have a little something for you on my blog, no worries if your not into this type of thing! jen recently posted..Oh so fabulous! Hey, thanks for stopping by. I’m glad you found me! I will definitely visit you on your blog! anotherjennifer recently posted..Yes, you can.